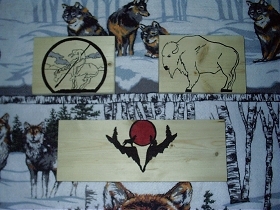 The log furniture at Native Timber Log Furniture features artwork designed and created for you by local artists of the Flathead Reservation. 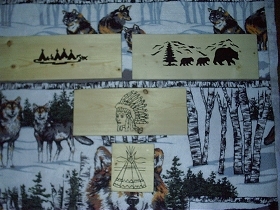 Artwork on the log furniture includes Native American, Western and Southwestern designs. We strive to create not just log furniture, but pieces of art for your home, meeting the unique requirements of our customers. As you browse thru the log furniture on our website you will see the artistic talents that we have here on the Flathead Reservation in Polson, Montana. Don't forget to take a look at our Tipi Furniture ! Not only is the log furniture a piece of art, but it is crafted to be environmentally friendly and to last for generations. 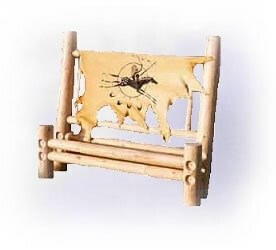 Our log furniture is built by utilizing the natural resources of our reservation. At Native Timber Log Furniture we gather dead fall timber for our log furniture rather than using living trees. We use a finish that is nontoxic, non-yellowing, and water based. The finish we use will protect the log furniture from UV discoloration maintaining the woods beauty. Each log furniture piece is created with quality craftsmanship that comes from working on each piece with care and dedication making sure log furniture is built solidly and insuring it will last for years to come. We are employee owned and operated by lifelong residents of this area and love creating one of a kind log furniture with great prices. Give us a call to create that special, unique piece of log furniture that you have always dreamed about. Log furniture accessory you desire ! 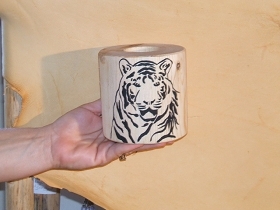 All log furniture is available with western or native art. Native bead work can be attached onto the pole of the furniture and artwork can be painted or wood burnt onto the surface. 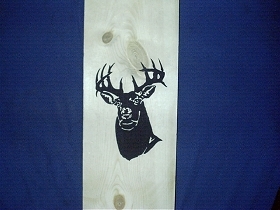 Log furniture finishes include stained, burnt, or clear coat. Some examples of our artwork is below.